Founded in 1984, this private ranch facility for elephants is one-of-a-kind in the world. 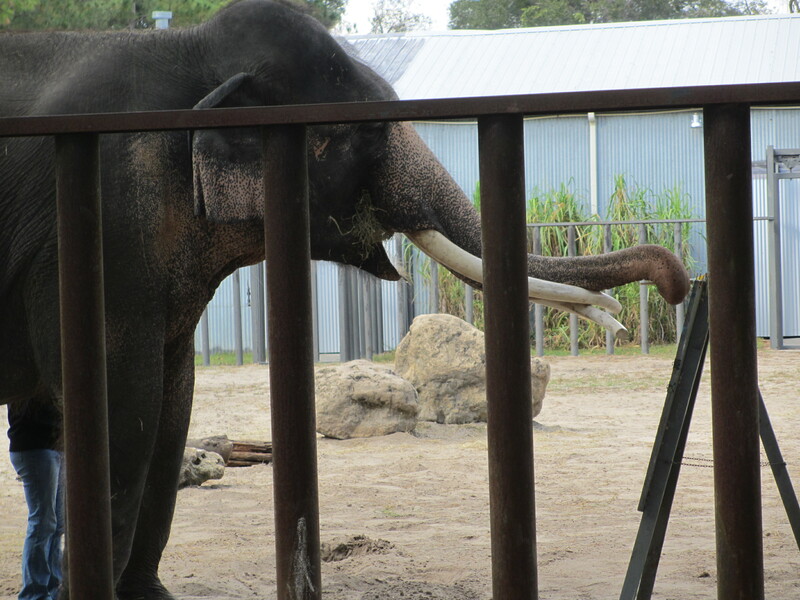 It is used to board Asian and African elephants temporarily or permanently, perhaps for medical or retirement reasons, behavioral problems, during emergencies such as hurricanes, or while their home facilities are being remodeled. Having an elephant to stay does not come cheap! 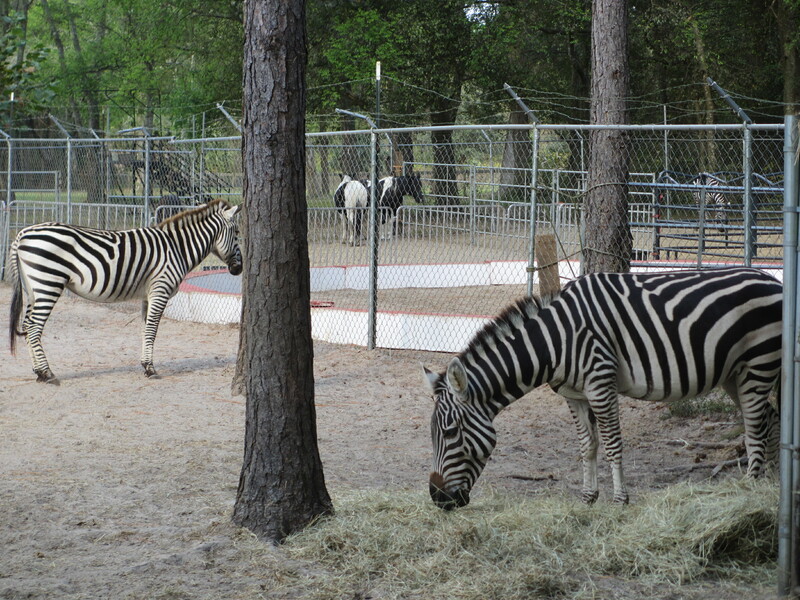 They eat 250-400 pounds of hay, grain, vegetables and bamboo and drink 150-300 gallons of water every day. Just across the grassy area, the elephants can be seen contentedly grazing on piles of hay in their individual compounds. There are suitably sturdy metal posts to contain them securely. When I visited, there were four elephants in residence – Luke, Bunny, Raja and Roxy- but over the lifetime of the ranch, more than 300 elephants have passed through the gates. They are housed in huge barns heated to 62°F in the winter. 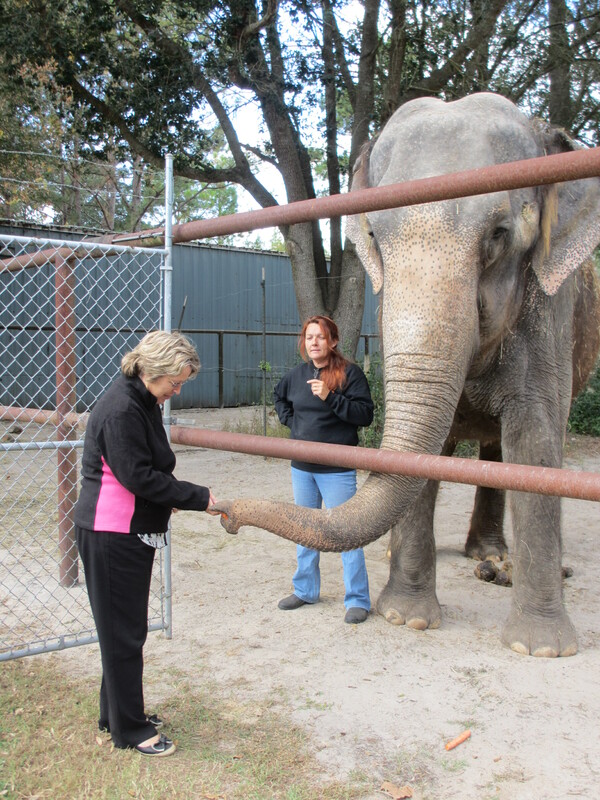 The tour begins at the seating area overlooking Luke, the 27-year old Asian male elephant. Patricia gave a short talk about elephants and then answered plenty of questions from the audience. She is the ninth generation of her family to work with exotic animals and clearly has a passion for elephants and a desire to instill awareness about the plight of elephants in their native countries. As she interacts with Luke, she looks tiny at the side of this 12,000 pound Asian elephant with his freckled trunk and perfect white tusks, which are crossed at the front. Luke demonstrates his complete trust in Patricia by lying down at her command. 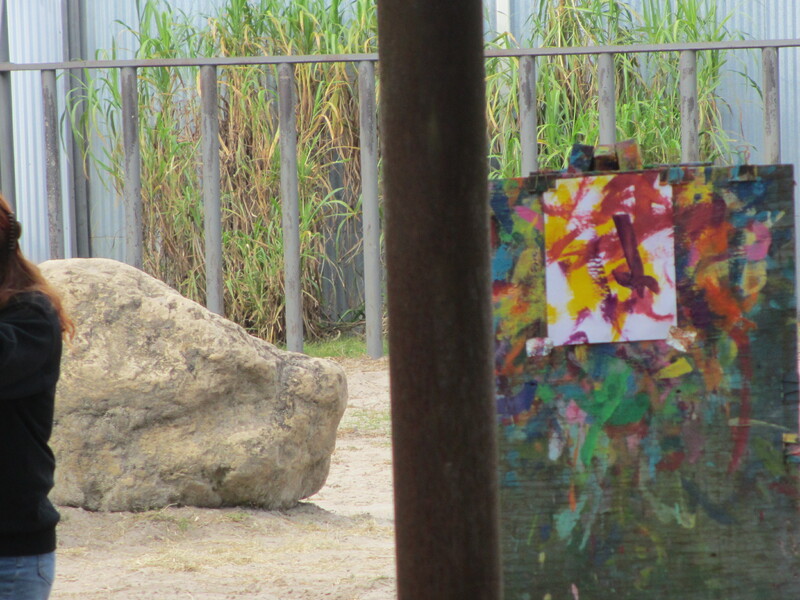 He then stands and does various poses before an artist’s palette and easel are set up. He ambles over, keen to take the paintbrush from Patricia and approaches the sheet of paper on the easel. Amazingly, he judges his distance by touching the paper with the tip of his trunk and then he carefully strokes the paper with the paintbrush. He steps back and is given another paintbrush loaded with another color – it is absolutely spellbinding to watch him paint! The tour continues around the other animal exhibits on the ranch. 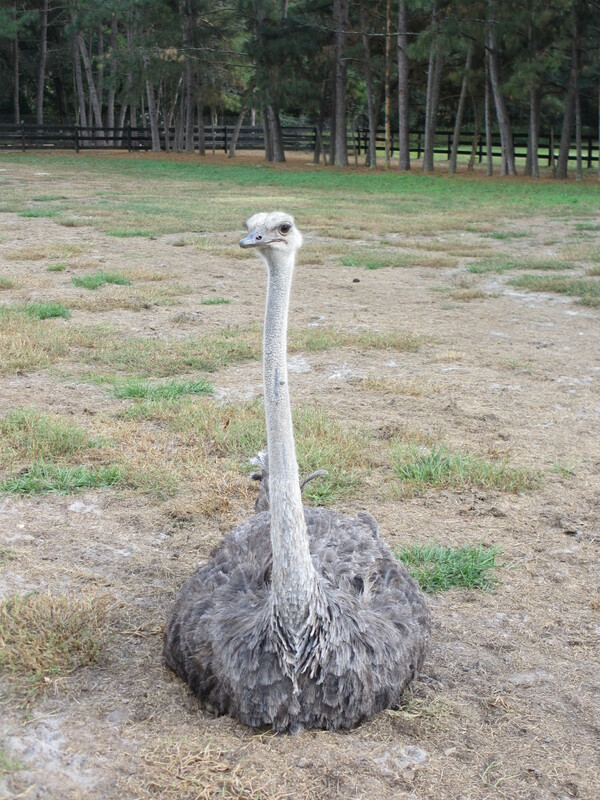 This includes two spur-thighed tortoises, weighing a massive 175 pounds; Grant Zebras with their distinctive stripes which are apparently as individual as fingerprints, then around to meet Katherine the ostrich and Peppers the emu in their expansive grassy pens. After admiring Bob the cockatoo and Murphy the beautifully colored green Amazon parrot, the informative tour ends in the museum and shop. Display cases hold some interesting items relating to elephants, including a massive elephant skull, many ivory tusks, and a wonderful elephant carved in detail from a tree trunk. The one-hour tour is a wonderful opportunity to see these animals close up. Guests can feed Roxy with carrots, a great opportunity to get right up close and interact with the elephant in a very unique way. The peaceful ranch environment makes a wonderful day out for all ages and your admission fee helps continue the ongoing work of this non-profit program. There are many more interesting and unusual places to visit in my book available in all formats on Amazon. This entry was posted in Florida and tagged Days out in central Florida, two tails ranch. Bookmark the permalink.